VV's 30% off cards are only good until the end of January if you have any. I cleaned out the basement before Christmas so I have some that I'm going to use up then I'll use the 20% only on items not included on sale days. Its a sad day IMO that they've done this there doesn't seem to be much incentive to donate more than 1 bag anymore due to not getting a higher discount for the more donated. I get the 20% off coupon for 1 bag. Ciel and coupon girl like this. With the carbon tax pricing in Ontario or being implemented, I'm not surprised that thrift stores are changing coupon offers. By the way, Salvation Army on Facebook has been requesting clothing and household item needs in Western provinces. Yesterday at Talize's Buy 2 and get 3rd free sale, I picked up a Guest book for $1.99, a rose gold small toiletries bag for $1.99 and a mini leather French coin purse (99 cents, but free due to sale). Happy with finds! coupon girl, 1cheapb*tch and Linda Evans like this. 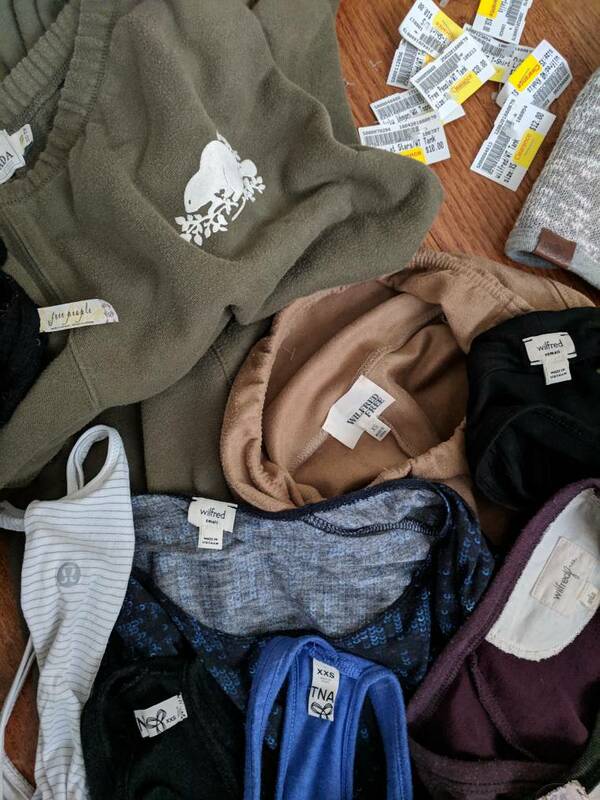 Value Village 50% off clothing sale (public) today-two Dockers pj flannel bottoms (reg. price $5.99 and $3.99) cost me $5.65! The woven drawstrings take washings very well. paid $4- it probably wont fit my touchpad but was thinking of buying a Fire tablet. Plato's closet has 90% off clearance! Spent $20 and got so much!! Everything I bought was $ .60-$2. Ciel, coupon girl, roxybabe39 and 2 others like this. Still can't believe my luck!!! Last edited by innaor; Mon, Feb 4th, 2019 at 07:57 PM. Ciel, GoJays, walkonby and 3 others like this. I found 4 new tea towels for $3- also a new wire cookie tray ,$1-, am gonna use this as a shelf in my kitchen cupboard. Ciel, GoJays, coupon girl and 2 others like this. Ciel, walkonby, innaor and 2 others like this. Not sure if I was the only person that didn't understand how the 20% off program works so thought I would share. When purchasing items you get a 5% off for every $20 spent at least this is what I was told, and you bank the 5% up to $20%. It was my understanding that you would then get 20% off of your order much like the old 30% punch cards. This is not so, you only get 20% off of up to $30 spend, so for a $60 order, you would need 2 x 20%. Ciel and TudorChick like this. wendymac, Ciel, coupon girl and 2 others like this. Burlington's Goodwill donation centre and store on New St. will reopen on April 12! 20 % off regular priced items from April 12-14.
rayray, wendymac and Linda Evans like this. Last edited by coupon girl; Wed, Apr 17th, 2019 at 04:49 PM.